U.S., Russian representatives jointly make Bering Strait navigation initiative at Arctic Council meeting. By Xinhua, March 24, 2018. Russian Far East Regions Plan for Railroad to the Bering Strait January 2010. Putin Proposes Tunnel from Russia to Alaska March 2008. Transport tunnel through the Bering Strait to link continents. Video. Samir Shakhbaz interviewing Alexander Bgatov and Aslambek Aslakhanov. 2011. Bering Strait Great Project on the Agenda This Year. August 2010. White House Reactivates WWF Imperial Scheme for Bering Strait Nature Preserve. August 2010. G20 Seoul Summit 2010. November 11-12, 2010, Seoul, South Korea. Other articles - in Russian language. Russian-American Team: World Needs Bering Strait Tunnel April 2007. Digging to America. By Oleg Nikishenkov. September 5, 2011, the Moscow News. Bering Strait Tunnel Would Link Russia and Alaska. By BMcPherson. Revitalizing the real estate market and the economy might help with funding construction the railroad to Alaska. October 26, 2011, by Fyodor Soloview. Robbins Double Shield Breaks Through at Russian Rail Tunnel. OJSC Bamtonnelstroy, a division of SK Most Company has completed a 4.5 km long section of tunnel in Sochi, Russia. March 2011. Other articles - in French language. Russian Railways chief Vladimir Yakunin believes tunnel can be built under Bering Strait. Canadian government overhauling environmental rules to aid oil extraction. High-Speed Rail Link between Moscow & St. Petersburg Could Cost Budget $35 Bln. Bering Strait Tunnel talks heat up again. Bering Strait Map. Two videos. Connecting America and Russia By Railway Tunnel. Translation of a news story broadcast by Ukrainian television channel INTER on September 23, 2012. Correspondent Maksym Drabok. A Railway From Canada To Alaska: Ready To Be Built In Six Years. By Fyodor Soloview. Alberta-Alaska railway: Will it be built? Alaska Dispatch. November 18, 2012. Alaska-bound rail project could solve Canada's oil sands problems. By Diane Francis, Canada Financial Post. November 16, 2012. Modern Railway Project Could Serve the Northern Peoples as well as Solve Canada's Oil Export Problems. By Alf Nunweiler. December 15, 2012. Trans-Siberian Railroad Getting New Lease on Life. By Alexander Panin. The Moscow Times. The Pasific Development Corridor: Maglev Across the Bering Strait. By Benjamin Deniston, EIR. September 13, 2013. Russian Far East railway project may extend to Hokkaido. By Daisuke Nishimura, Asahi Shimbun. June 4, 2013. China High-Speed Rail: Girdling the Globe With a Tramway of Iron. By William Jones, EIR. May 23, 2014. By Dana Liebelson, The Week. May 19, 2014. China Eyes Up Constructing Railway Under the Bering Strait. By Tom Arnstein, The Beijinger. May 10, 2014. 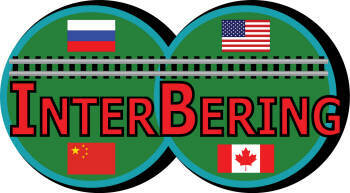 ANALYSIS: China-Russia-US Bering Strait Railroad Plan "Feasible'. By RIA Novosti. May 13, 2014. An Orient Express For The 21st Century? By Steve Hanley, GAS2. May 13, 2014. China 'considering' building high-speed rail line from Beijing to the United States. By South China Morning Post. May 9, 2014. Chinese experts 'in discussions' over building high-speed Beijing-US railway. By Jonathan Kaiman, The Guardian. May 8, 2014. Is China planning a high-speed rail line to Canada? By Matthew Robinson, The Vancouver Sun. May 23, 2014. China Wants To Build Rail Line To America. By Robert Gehl, DownTrend.com. May 10, 2014. On The Fast Track. The California High-Speed Rail Authority wants to finish a line from San-Francisko to Los Angeles by 2029. By Christofer James Palafox, American Builders Quarterly. By English Nes, Xinhua, China. January 15, 2015. System analysis of transportation alternatives for support the mining operations of the Russian Arctic shelf. By Dyomina O.A., Kibalov Ye.B., Khutoretskii A.B. Novosibirsk, Russia, 2014. 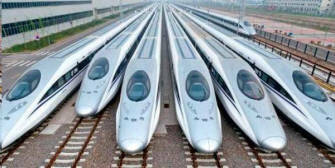 China Bullet train to Come to American Southwest. By Irwin Dawid, Planetizen. Sept. 20, 2015. A Superhighway Across the Bering Strait. By Adrian Shirk, The Atlantic. July 1, 2015. Plans for superhighway linking Britain and America. By Oliver Smith, Travel. March 25, 2015. Moving Canadian products to China - by railway. By Gerald Pilger, CountryGuide. April 17, 2015. Putin confidant Yakunin unexpectedly quits powerful railway post. By Gleb Stolyarov and Jack Stubbs, Reuters. August 18, 2015. The Bering Strait: Choke Point of the Future? By Louis P. Bergeron, SLD. November 19, 2015. A Vision of Strategic Plan for High-Speed Rail in America. Excerpt from remarks by the 44th President of USA Barack Obama. The White House, April 16, 2009. Siberia in the 21st Century: Problems and Prospects of Development. By Fyodor Soloview, President InterBering, LLC. January 22, 2017. To be presented at the International Congress "Siberian Platform: time for new solutions" and the Krasnoyarsk Economic Forum, 19-22 April 2017. Frank Murkowski, Former U.S. Senator and Alaska Governor, speaks on the topic "Canada-Alaska Rail Link Opportunity" and about "What Would It Take To Link AK & Canada By Rail" - part 1 , part 2 and part 3 with Maria Athens from Coastal Television Broadcasting Co. More details on this project by Annie Zak from Anchorage Dispatch News. April 2, 2017. China Says Trump Open to Cooperating on Silk Road Projects. By Bloomberg. June 25, 2017. Denver, Center of the Cosmopolitan Railway. By Carl Abbott, CityLab, April 3, 2018. Transcontinental railroad, Panama Canal, Interstate Highway System, Every 50 Yrs, Trump Infrastructure Plan Is 10 Years Overdue. By Insidesources, February 4, 2018. 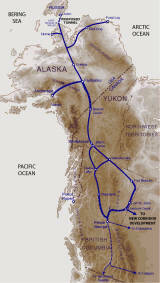 Transforming Alaska's next 60 years: The intercontinental railway. By George Koumal, Joseph Henri, Scott Spencer. Anchorage Daily News, January 24, 2019. Rival oil-by-rail plan has Fort Nelson FN support. Two rival groups are promoting the same Alberta to Alaska oil-by-rail proposal. By Nelson Bennett, Business in Vancouver. December 8, 2017. After Silk Road, World Land Bridge? "Siberia can be connected with Alaska, if an undersea tunnel is built across the Bering Strait". An interview with Helga Zepp-LaRouche, the co-founder of The Schiller Institute (TSI). B y Atul Aneja, The Hindu International, September 22, 2016. "BIG TICKET". Is Alberta to Alaska Railway Port Mac's Sugar Savior? The Alberta to Alaska railway may become a reality in 2022 if Sean McCoshen of A2A Railway has his way. Published by Dennis Anderson, Anchorage Press, January 3, 2019. Governor asks Trump for permit needed to connect Alaska railroad to Canada, Lower 48. Alaska Gov. 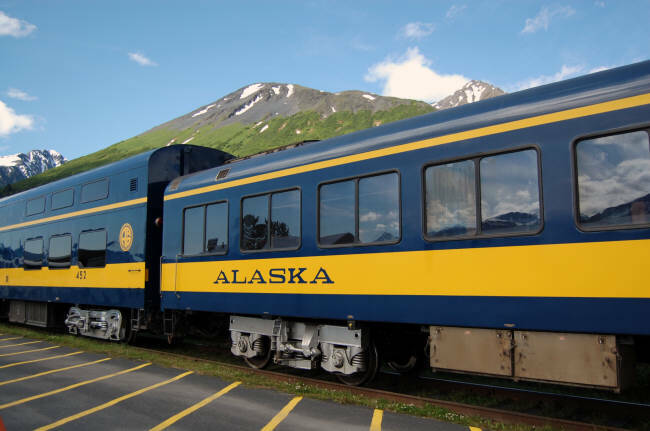 Mike Dunleavy is asking President Donald Trump to grant a presidential permit to extend the Alaska Railroad into Canada, supporting a Canadian company seeking to blaze a new path for Asian-bound products. Author: Alex DeMarban, Anchorage Daily News, April 1, 2019.